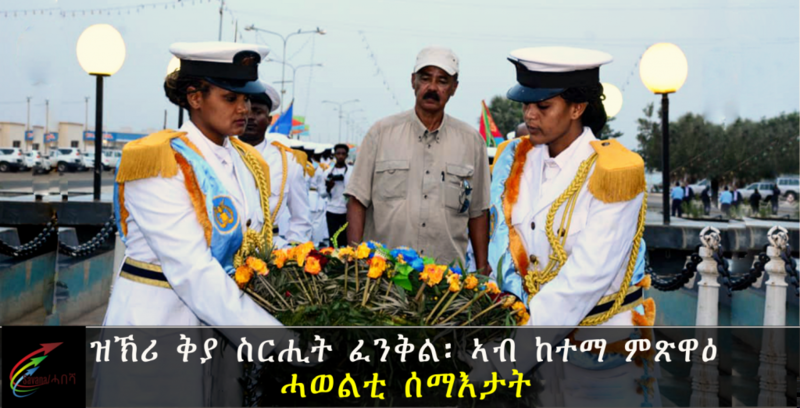 Each year, in the month of February, Massawa takes center stage in the heart of Eritrea as it commemorates Operation Fenkil. History has come to many places, has stayed awhile and, after its departure, has rendered those places famous. In Eritrea’s saga, perhaps no place has taken on greater historic importance than the Northern Red Sea city of Massawa. There, during three winter days, February 8-11, 1990, the Dergue’s fate was sealed. When the operation was over, Mengistu’s circle of trust was in disarray. Operation Fenkil would forever hold a place in the minds of all Eritreans. On February 8, 1990, the EPLF forces began the offensive by cutting off the critical supply route from Massawa to the Asmara garrison. The surprise attack stunned the Ethiopian military and by the following afternoon the EPLF forces were in the suburbs of Massawa. On the third day of the offensive, the Eritrean forces captured the Ethiopian naval base near the town. The only remaining portions of the city to rid of Ethiopian troops were the islands. To achieve this Eritrean forces used their nascent naval forces (mostly small gunboats) to attack from the sea during an artillery barrage. Using this artillery fire, the Eritrean armory moved onto the causeways that connected the islands with the mainland. The first of these tanks was destroyed by the Ethiopian garrison. However, they were eventually overcome by the EPLF. After this defeat, the remainder of the Ethiopian forces retreated to Ghinda. Even after the loss of Massawa, the Ethiopians continued their aerial bombardment of the city. The civilian population was hardest hit as the EPLF forces had followed the Ethiopian troops to Ghinda. The Ghinda front, which extended from Ghinda to Adi Roso and Northern Red Sea, baptized with names like ‘Enda Bumba”, “Feres Sege”, “Gahayat”, “Enda Kewhi”, “Enda Harestay”, “Enda Misayl”, and “Shndwa” signified Eritrea’s relentless march towards independence. The front withstood a non-stop heavy military offensive from the enemy from February 1990 up to May 1991. This front was used as a final frontier to completely destroy the enemy and ensure independence. What made this operation a victory against all odds was the mismatch between the two forces. On one side, you had the best trained and largest army in Africa, which was well-equipped with all types of weapons bought at the expense of a starving people. The 1985 famine in Ethiopia did not deter the enemy from arming its soldiers to the teeth to fight a long and bloody war. On the other side, you had Eritrean freedom fighters, fewer in number, but tactically astute and highly resilient. Operation Fenkil took a good 59 hours to complete. It involved a strong combination of ground troops, naval troops, and the mechanized front. The operation resulted in the surrender of 20,000 Ethiopian soldiers, the destruction of much of the Dergue’s military hardware, and the liberation of Massawa and Ghinda. The freedom fighters’ resilience in the operation was astonishing.Theystrode to the port with great courage and determination. It was a time to no longer look back but to push forward. Independence was within touching distance and, boy, did they push and push. The enemy did not know what hit them – their tanks were dismantled and their ships were sunk. To the freedom fighters, the assaults meant the potential for death. If they had to assail the enemy, it should be done when success seemed assured, and the resultant victory was worth the cost. I do believe that what the Ethiopian army learned at various battles fought against the Eritrean freedom fighters was that the tegadelti could show superhuman endurance if they wanted. I have seen many pictures of Operation Fenkil. They show how the freedom fighters poured their sweat to preserve their blood. Some show young fighters carrying heavy logs up along the narrow roads of Sigalet Ketan in a place where the temperature can reach up to 50 degrees Celsius.The enemy moved with tanks and was accompanied by Stalin organs, MiG bombers, and bags of lies and propaganda. The Ethiopian Kitaw division was supposed to punish the freedom fighters for their insolence, the Nebelbal was supposed to consume with a blazing fire those who resisted, and the Tewerwari was the panzer division or a deployment force. Alas, all disappeared in the hands of Sahel-trained wonders, along with their bizarre names and funny ideas. Resistance was the only Eritrean weapon that the enemy dreaded. What is the use of napalm and ten-barreled mortars if the one you are tackling knows how to resist? It is the resistance of the scorpion which after an atomic blast in its surroundings continues to crawl, stinging right and left. Endurance, self-sacrifice, and fortitude are commodities that are out of stock in this decadent world, but our tegadelti were made of these traits. They proved it when they relentlessly defended Nakfa and Sahel. And in the battle to win Massawa, they redefined the art of war and made it their own creation. A lot has been said about the endurance and fortitude of the Eritrean army in front of superior firepower and a far larger army, aided and supported by the Russians, East Germans, the Cubans, and the Yemenis. The enemy, coming from more verdant and guest-friendly terrain, thought it was fighting on two fronts: the people and the land. The Ethiopian soldiers wore boots, ate canned food, had helicopters to take them to the nearest hospital or clinic when wounded, drank beer, and had sweethearts (at the point of a gun) in every village or town under their control. The freedom fighters wore sandals, ate weddi aker (sorghum mixed with weevils), mostly walked to the nearest surgical unit, drank contaminated water, and eschewed all the frivolities or luxuries associated with an easy life. It was simply a bitter pill to swallow for the Dergue soldiers that they would never henceforth defeat the Eritrean freedom forces. “What do they have that we don’t have?” shouted Mengistu. Nobody dared to tell him that those boys and girls over there had endurance and fortitude in large quantities, something that he couldn’t obtain by traveling to the Soviet Union or East Germany. Massawa proved, once and for all, that independence was inevitable. When the Dergue came to power, Massawa wason the receiving end of harsh mistreatment. During the period, two important events can be recalled: the Offensive of Salina to liberate Massawa in 1977 and Operation Fenkil in 1990. Today, the coastal city featuresspecial monuments that allow visitors and locals to remember those historical events.